Cob building is one of the oldest forms of adobe building, and one of the most sustainable with high insulation values, longevity, local materials and zero toxicity. In Western societies such as ours, enormous resources and energy are poured into creating huge, toxic houses. Cob lends itself to small, efficient, individual and affordable homes. We are proud to partner with Eco-Homes and Cobel - the Zen of Earth Building - to research, develop and promote this form of building. Though small, this building was co-constructed and planned by Australia's leading experts on cobel building. The cob works are on display at the regular tours of Bellbunya. The building has been progressing slowly, with free workshops held at Bellbunya over the last few months. The workshops have given people an opportunity to experience cob building first hand, taking away a little mud, great memories and skills. Whilst labour intensive, it requires little in the way of skills; even children can build these homes. nd specialised methods. Whilst it takes a significant amount of labour to build in cob, it can mean moving away from a banking system of huge house mortgages that take decades to repay. 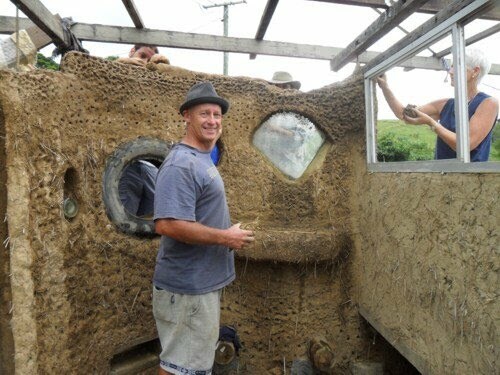 Cob is an ancient, simple and yet extremely versatile and beautiful building method. The main tools are your hands and feet, whilst the materials are earth and straw. Cob has stood the test of time - with many European cob cottages that are hundreds of years old. In Yemen, cob has even been used to build 10 story buildings. Cob is simple, very forgiving and very manual. Cob removes building from the experts and gives it the people - it's great for groups of people to work on together. Without any machinery noise or dangerous tools, children and adults can work side by side and have fun, whilst creating from cob. Come along to learn the basics, help build a little shed, have some fun and get to know some like-minded people. These photos were taken at the April 2011 workshop. With just some roofing and rendering to go, excitement is building for the next cob project. Contact Bellbunya for details of the next cob workshops.